Your Tripawd dog is one-of-a-kind, so why shouldn’t your pup’s harness be an original too? Now it can be, with totally custom Tripawd® Convert Harness Badges. Wyatt shows off his job title. Got a special nickname for your pup? Want to let people know they should ask before petting your dog? 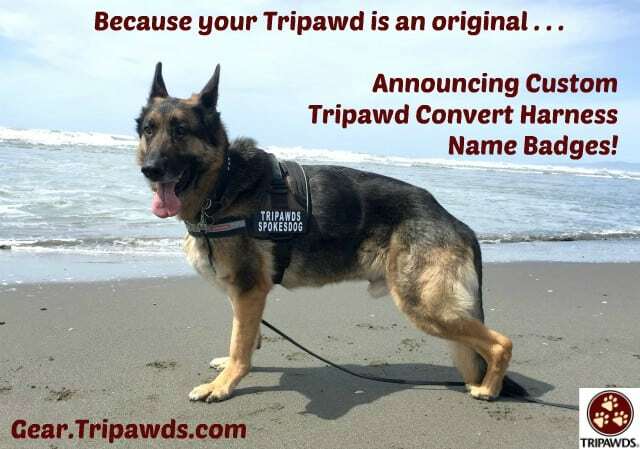 Now you can with custom badges for the Tripawd Convert Harness! Order your Tripawd Convert Harness with Custom Badges here. As you’ll see in our review of the original Tripawd Convert Harness, this rugged dog gear is ideal for walking and casual use for dogs who don’t need a lot of help getting around. Just place it over your dog’s head, buckle and go. Your dog doesn’t need to step into it. No more chafing. The front chest strap sits across the chest instead of behind the front legs. Lightweight but rugged, durable and breathable in warm or cold weather. Comfortable handle for hands of all sizes to assist a Tripawd in getting around. The Convert harness was created by John Hatcher, a Tripawds supporter whose beloved dog Hurley was diagnosed with osteosarcoma in 2011. Hurley’s story is documented in his Tripawds blog, Hurley’s Journey. 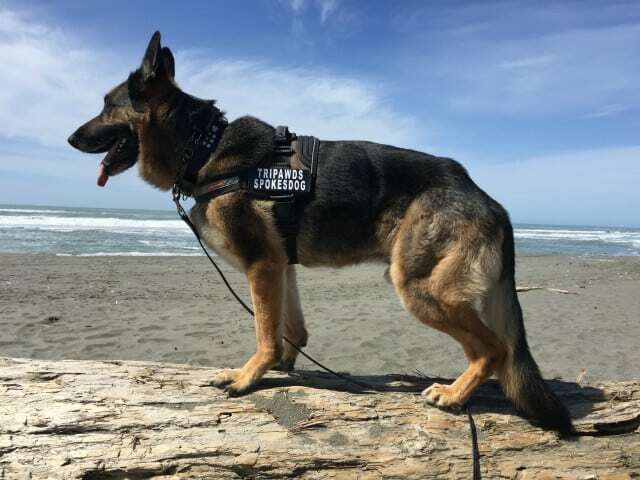 John’s company offers a wide selection of rugged outdoor gear for dogs, and we’re thrilled with his latest creation, Tripawd Convert Harness custom badges. to see if it’s right for your dog. It’s easy to order your custom badges. This version of Tripawd Convert Harness also comes with two “Tripawd” side badges so you can swap them out as you wish. Sold in sets of two, each badge fits on the harness with velcro, one for each side. Keep in mind that these badges only fit this harness, and there are no returns on the badges. Choose badge color backgrounds in black or red, with pink hearts or purple hearts. Keep in mind printed colors may vary slightly due to individual monitor settings. Badges can have a maximum of 20 characters on each badge, including spaces. The badge lettering is printed in all white, capital letters. The text and spacing will appear exactly how it is entered when added to cart. The same text will appear on both badges. Please don’t use trademarked or inappropriate text. Once we have your order, allow an extra 3-5 days for processing, plus two-day UPS Express delivery time. Wyatt is a one-of-a-kind, just like his harness. Order Custom Tripawd Convert Harness Badges Here! I may have missed it, but is it possible to order a custom badge if you alreay have the harness?? YES! Thanks for reminding us that we need to make this an option. Watch for an update next week. If you want it sooner, you know where to find us.